With the unabated growth of the internet, companies are being challenged to protect unprecedented quantities of data from determined and targeted attacks. While security regulations mandating the protection of sensitive financial, health-care or personally identifiable information (PII) serve as the primary impetus for data-protection, breached companies have learned the hard way that brands can be damaged, leading to significant financial costs when even unregulated data, such as e-mail and home-addresses, are breached1. Although encryption technology has been available for more than forty years2, its use was initially relegated to military and banking applications where breached information has extremely high consequences. Twenty years ago, the world-wide web ushered in the Secure Socket Layer (SSL) protocol with its use of encryption to protect information as it traversed the internet. However, it was perceived as an enhancement to network protocols, and consequently, encryption technology continued to remain outside the domain of business applications. As a result, companies have lacked a universal architecture for the protection of sensitive data across the enterprise. Global companies are becoming aware of this handicap as countries start enacting legislation for data-protection within their borders. With the advent of cloud-computing, businesses can now come to market at lightning speed with massively scalable infrastructure to address their just-in-time computing needs. While the business benefits are indisputable, security concerns remain the single largest road-block to the wholesale adoption of cloud computing. Which country's data-security regulation governs protection of that data. This paper defines a Data Encryption Infrastructure (DEI) - also sometimes referred to as a Document Encryption Infrastructure - as a collection of technology components and application architecture governing the protection of sensitive data within an enterprise. Free and Open-Source - Ideally, the infrastructure should be capable of being built with free and open-source software (FOSS) to ensure it is within the reach of even small companies; however, this is not mandatory. While a DEI can be built in many different ways, this paper defines a DEI Reference Implementation (DEIRI - pronounced “Dairy”) that has proven to be successful in multiple industries and companies of different sizes and locations. The DEIRI is based on the following diagram and depicts a minimal Production implementation that addresses a fixed level of business requirements. Depending on a company's software development and quality-assurance practices, it may choose to deploy similar DEIs for Development and Quality Assurance environments. It does not matter whether the DEIRI is implemented within the company's perimeter or is hosted by a service-provider within a virtual perimeter dedicated to the company5. The DEIRI has a minimum of two geographically separated deployment locations where components of the DEI are duplicated for redundancy; replication between the separated DEI keeps them synchronized. A DEIRI has at least one Front-end Processor (FEP) per location serving as the primary interface to applications requiring document-encryption and decryption services. The FEP is a stateful machine with a local database and provides web-services to applications. Managing CE so they may be started or shutdown depending on the current processing load. Handing the results of the request back to the FEP. A DEIRI has at least one Key Management System (KMS) per location serving as the centralized repository and manager of all cryptographic keys. It is a stateful machine with a local database, and provides web-services to applications for the encryption and decryption of small, structured data-elements. It can be used by applications to request the encryption of data such as credit-card numbers, drivers license numbers, etc., without the overhead of going through the FEP. The KMS can also be called upon by a CE and optional Encrypted Volumes (EV) to encrypt and store cryptographic keys, serving as a secure key-vault to the enterprise. Replicating objects to other KMS within the DEI. Handing the results of the request back to the calling application. A DEIRI has an Identity and Access Management (IAM) system serving the DEI. The IAM is based on a Lightweight Directory Access Protocol (LDAP)-based Directory Server, and may be an existing enterprise IAM or one dedicated to the DEI. It is responsible for authenticating and authorizing requests to all components of the DEI and can be managed independently or through administrative functions on the DEI's FEP. The IAM is redundant and accessible from all DEI locations for business continuity. A DEIRI has one or more Storage Locations (SL) serving the DEI. They may be Direct Attached Storage (DAS), Network Attached Storage (NAS), Storage Area Networks (SAN) or Cloud Storage from commercial service providers or within the enterprise. The FEP and/or CE are capable of communicating with the SL and managing a large number of files on them. When passing plaintext blobs between components in the DEI, the plaintext blobs are stored in Temporary Storage Locations (TSL), which are cleaned up by the FEP upon successful encryptions and by the calling applications upon successful decryptions. TSLs are always configured on DAS, NAS or SAN devices within the control of the data-owning company, and always inaccessible outside the company's perimeter. Ciphertext files are stored on Permanent Storage Locations (PSL) which may be on DAS, NAS, SAN or Cloud Storage - anywhere the company chooses, since the data is encrypted on the CE (or the KMS in the case of small, structured data-elements) and the cryptographic key is within the KMS in the controlled part of the DEI. Since the DEI is an implementation of the RC3 architecture, when the CEs and KMS are within a perimeter under the control of the data-owning company, the ciphertext comes back to the controlled environment before it is decrypted. This allows companies to comply with data-security regulations by simply keeping the CE and KMS in the jurisdiction controlled by the regulation regardless of where the ciphertext itself resides. For example, if the CE and KMS were deployed within a member nation of the European Union (EU) in accordance with the security requirements of the EU Directive, companies would be in compliance with the Directives' security provisions7 even if the ciphertext were stored in a public cloud outside the EU. This is because the cryptographic keys never leave the safe-harbor of the DEI and, consequently, the ciphertext must come back into the EU's safe-harbor to be decrypted. An Encrypted Volume (EV) is one in which the underlying storage volume or file-system is encrypted by a kernel driver or hardware component in the storage device. An EV does not require applications to be aware of cryptographic services since the EV assumes responsibility for encrypting/decrypting data, transparently, as it is written to/read from the volume. However, since an EV does not distinguish between different applications and/or users, once an EV is accessible to a system, all software – including malware – may gain access to decrypted data. On the other hand, a cryptographically-aware application would make decrypted content available only to authorized roles/users within the application. Unless authorized users and/or applications themselves are compromised, breaching sensitive data outside the cryptographically-aware applications remains very difficult. A DEIRI does not necessarily need EVs; however, they are useful as a transition-technology until the business application can become cryptographically-aware. In such an implementation, EVs will store their cryptographic keys within the KMS of the DEI and recover them only when necessary; this eliminates the risk of the key becoming compromised if the EV is stolen or lost. i) This concludes the encryption transaction request. j) This concludes the decryption transaction request. It is even possible for applications to make direct requests to dedicated CE of a DEI for direct control of the request scheduling and meta-data management, if desired. How does a DEI hold up in a real-world environment? The complexity of the infrastructure, and communication between different components of the infrastructure, seem to imply that while it might address one set of problems related to data-management, control and security, it might introduce another set of problems with respect to business transaction performance and usability. All software components of this DEI - with the exception of the CE private cloud's hypervisor - consists of open-source software. During internal testing, the author's company was able to benchmark (on equipment less capable than that described above) the encryption of large files at the rate of one (1) gigabyte per minute. While the example cited above is unlikely to match other business use-cases, given the configurability of the DEI and its components, companies can expect to tailor a DEI's performance and throughput through the use of faster components, more components (to distribute the workload), cryptographic accelerators and other performance-enhancing techniques. 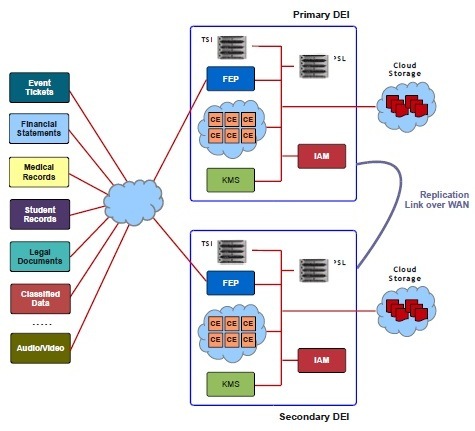 Just as network and storage technologies evolved from simpler configurations addressing local needs to highly complex infrastructures handling global requirements, the DEI is a similar evolution from simpler cryptographic tools to a sophisticated infrastructure designed to address scalable, highly-available and secure cryptographic services for the enterprise. Cryptography components have been available for over forty years to protect sensitive information within business applications; sophisticated cryptographic key-management has been available for nearly a decade to address some of the complexities involved in handling cryptographic keys. The DEI is the logical evolution of these technologies to make data-protection an ubiquitous service on the network, accessible to systems and applications through a uniform interface, with the ability to address diverse data-security regulations while leveraging the cloud for business benefits. Arshad Noor is the CTO of StrongAuth, Inc., a Silicon Valley company focused on enterprise key-management infrastructure for 11+ years. Arshad has been in the IT industry for 26+ years building applications and complex IT infrastructure for some of the largest companies in the world. He is the creator of the industry's first open-source symmetric key-management system and many cryptographic tools to simplify the use of this technology within business applications. He is the author of many white-papers – including the Regulatory Compliant Cloud Computing (RC3) architecture. He can be reached at arshad.noor@strongauth.com. 5 While it is our opinion that a data-owner company can outsource the operations of a DEI to anyone, it remains their responsibility to enforce the policies under which the DEI is used and managed. This author recommends consulting with legal counsel within their jurisdiction to determine their legal obligations before considering outsourcing a DEI. 6 The reader should be careful to recognize that when the CE sends an encryption request to the KMS, it is sending a cryptographic key as the plaintext to be escrowed. The KMS treats all plaintext as opaque objects and generates its own internal cryptographic keys to protect the supplied plaintext. Consequently, the cryptographic key generated in the KMS can function as a Data Encryption Key (DEK) when encrypting non-cryptographic plaintext, or as a Key Encrypting Key (KEK) when encrypting cryptographic keys. The cryptographic keys generated within the KMS are themselves, protected by a chain of KEKs, terminating in the Master KEK inside a cryptographic hardware module. 7 It is, nonetheless, prudent for companies to consult with their counsel for definitive legal advice on this implementation architecture. 8 The DEI operates on the premise that the network cannot be trusted. As such, it authenticates and authorizes requests in every component of the DEI providing for the highest level of security in the application. This lends itself to the possibility that DEI components can be geographically separated across the internet and yet operate securely using Secure Socket Layer (SSL) or Transport layer Security (TLS). 9 It is also possible for the KMS generate the cryptographic key, escrow it within its internal database and send the cryptographic key to the CE. However, a DEI is likely to have far more CE than KMS devices. Consequently, the DEI will experience greater throughput with more CE generating symmetric cryptographic keys than with fewer KMS doing so. From a security point-of-view, since the CE has visibility to plaintext sensitive data and the cryptographic key, its risk is not elevated by having it generate keys locally and sending it to the KMS for escrow. Can we use RC3 to make application FIDO compliant ? How we fit FIDO specs in above infrastructure?